A charity for inner city kids had a ‘Del Boy’ moment after a broach worth tens of thousands of pounds was found inside a battered desk – in a run-down CARAVAN. 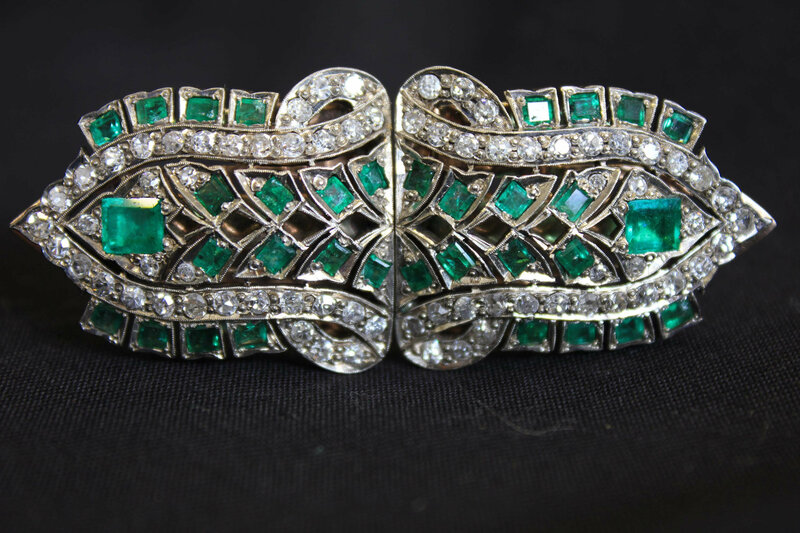 The precious jewel contains 75 diamonds and 34 emeralds and was discovered hidden in a secret drawer of a 19th-century bureau. The piece of furniture was in a caravan on a farm in Dartmoor in Devon belonging to the Shallowford Trust, a charity giving inner-city children an experience of countryside life. The Trust thought the chest could be spruced up to raise some money so asked antiques expert Simon Gilboy to take it to his workshop in Staverton, near Totnes. But when Will Arscott and apprentice Archie Newnham-Dibley set about restoring it, they found a secret drawer which housed a box from Royal jewellers Garrard and Company. The box was marked “Lady Braund” – the name of the mother of Shallowford’s founder, Elizabeth Braund. A jeweller confirmed that the stones were genuine. Now the Trust is searching through Braund family albums for a photograph of Elizabeth or Lady Braund wearing the brooch, to help date the find. Discovered with the 2.5 by 1.25 inch brooch were letters from a young Elizabeth to her mother. The discovery is good timing for the charity, which is trying to turn farm buildings into accommodation for the children. The project will cost several hundred thousand pounds, with some money coming from the Braund family legacy. Mr Gilboy said: “It’s not unusual to find letters or coins in a piece of furniture. We once found a ring, which was returned to the owners. “Out business is built on trust. Anything found while we are restoring a piece for owners is given to them. “If a piece is bought at auction it is different, but if it is bought from an owner there could be a moral dilemma.